Browse: Home /	Intern Reports, LIVABLE STREETS, Transportation / HOT Lanes a Hot Topic! The problem with freeway congestion can be described using a simple economic concept. Demand for roadway space is greater than the supply and this gap has only increased over the past decade. Not only has the demand for road space increased but also the distance traveled by vehicle. The result is more highway congestion with more carbon emissions because of the constant stop and go of the traffic flow. On December 17th, in a seminar put on by the University Transport Research Center, Associate Professor of Transportation Engineering at Washington University Yinhai Wang explained how HOT lanes could be a potential solution to that problem. HOT lanes are a combination between an HOV (High Occupancy Vehicle) lane and a toll lane. 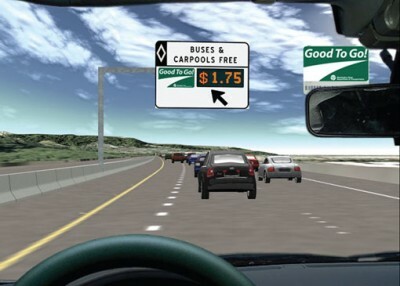 Either high-occupancy vehicles or single-occupancy toll paying vehicles could make use of the lane. The argument for installing HOT lanes is to make more use of HOV lanes. Studies found that the HOV lane is underutilized by drivers unless it is in the morning peak hour. In his lecture, Wang discussed what the best HOT lane design and rate would be. Some in the audience question the validity of the argument that it would decrease congestion. If you build more lanes and decrease travel time, it would attract more drivers and therefore create congested driving conditions. I would suggest that an implementation of HOT lanes should include using the toll revenues to fund public transit along the same traffic corridor in order to encourage more people to use public transport and other alternatives to driving. Check out more information about HOT Lanes here!